It's worth pointing out that Optional is very similar to the Option class in Scala, which is part of the core library and not an add-on. And I'd argue that the JSR-303 validation annotations are better to use than the JetBrains ones, because being a JSR they are (in theory) better supported. Plus you get to use the JSR-303 Bean Validation stuff too, and we even go further than that and have aspects that wrap our public methods to do validation of all the input and output objects using the JSR-303 Validators to ensure that the data into and out of our APIs are safe. "Use the @NotNull annotation everywhere else. This is optional. The Guava people do not, I do." 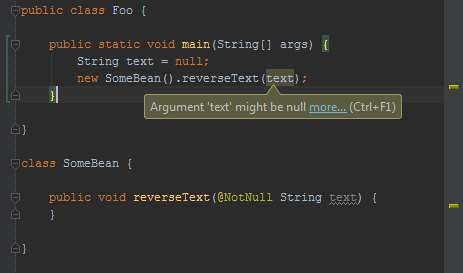 When you put @ParametersAreNonnullByDefault on your package (I do, and I hope you do too), a good IDE (I use Eclipse, but I hope this also works on IntelliJ) will inform you when putting @Nonnull is not necessary. JDK 8's Optional is a step backwards from Guava's, because you can't use it with a foreach statement; it is not an Iterable, and will not give you anything that's an Iterable (Guava's has .asSet() for that). A shame, but at least they did give it filter, map and flatMap. So for anything 'imperative', you'll need to check and then get, which is where errors happen. Or use a language where assigning null to an object variable results in a compile error, like Ceylon or Kotlin.